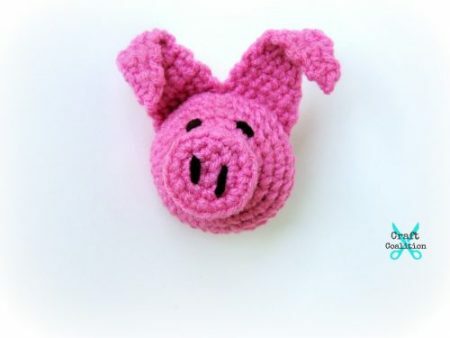 This Lil Flying Pig Amigurumi will give you the power to end all bets where anyone has told you, “When Pigs Fly!” Well, maybe it won’t, but who is going to stop you from trying? How many times have you heard that? “This is my original design and I just love him. 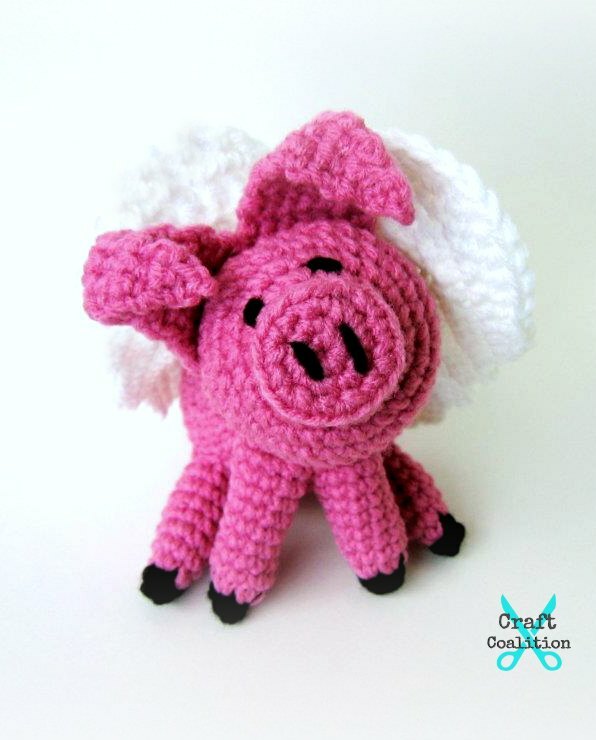 Never was much into pigs until now as this Lil Flying Pig Amigurumi crochet pattern has won my heart.” Now it’s your turn to try it out and have a giggle! Enjoy! This is otherwise known as “sc2tog”. Insert hook into st and draw up a loop. Insert hook into next st and draw up a loop. Yarn over, draw through all 3 loops on hook. That is one decrease. This pattern is worked in a spiral. 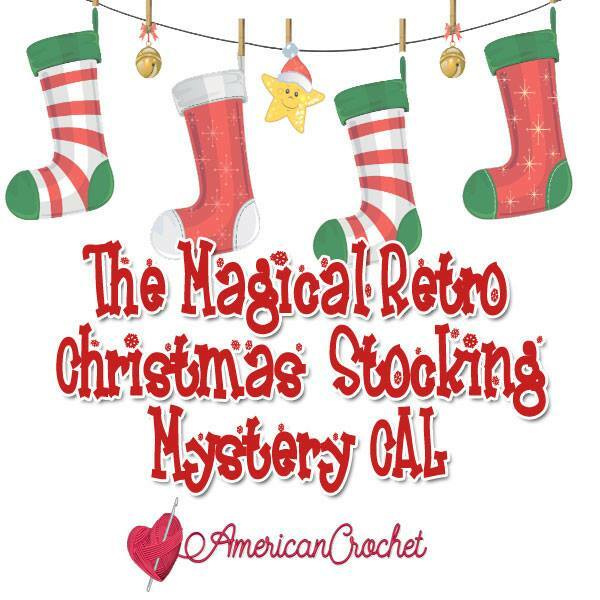 You will use your stitch marker to tell you where your row ends and where it begins. When working up amigurumi, the stitches should be tight in order to contain the polyfill. You will stuff the critters pretty tightly by using rolled up, small pieces of polyfill to really get it firm and it doesn’t lose its shape. Mix and match the different body types to create different personalities. Sew in black for nostrils. If ears aren’t stiff enough to keep a bit of shape, use an E-hook. Leave a long starting tail for sewing. Round 15: skip 1, hdc, Fasten off leaving a long tail. Once the bottom two rows are sewn flat to the back of the head, you can stitch the center of the ears down in a fold if you want a more dramatic droop. Sew nose on covering the first rounds where you started. This way, as you continue to work, the nose is pointing downward. Sew eyes in using black yarn and stuff as you go. Sew closed, fasten off, sew in the end. Sew ears flat onto back of head so they ‘umbrella’ over his head and eyes. For a refrigerator magnet, hot glue a magnet to the back of his head. 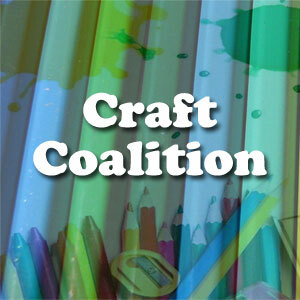 Pen & Pencil Toppers can be any color. Pig Legs require Pink and Black. Color changes added are for Pig Legs. Make as many as needed. 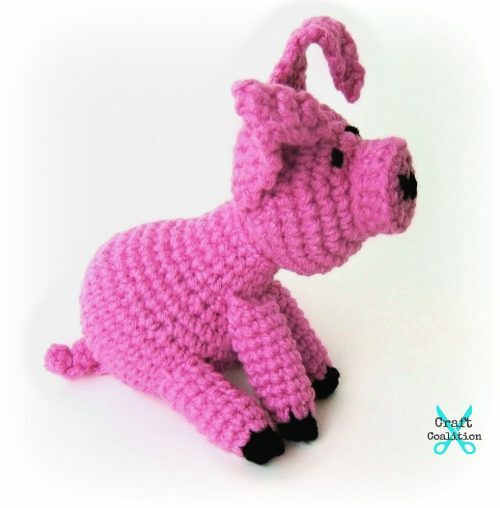 If pig is sitting down, stop here for back legs and fasten off leaving a long tail for sewing. The last 2 rows are to make the front legs. If he is standing, you could choose to make all 4 legs the same length or not. chain 11, * sc, 2 sc in next st * Fasten off leaving a long tail for sewing. Next, sew the body onto the head. This is where the personality really starts to play up. You’ll notice in my main pic, his head is tilted. That was a complete accident. I was trying to make him look straight up into the air. He was looking upward, but once I added all his legs, his head tipped and I love it! Once his head is on, you can decide if he will stand or sit and if you have made longer legs, they go in the front to give him lift and a younger, awkward appearance. I sewed the front legs on first and balanced him. The back legs, I affixed with yarn needles to see where to place them. You can also do this with an open paperclip. When the legs are in position, begin sewing them on and remove your needle or clip once they are secured and complete the process by sewing in the ends. Lastly, sew on the tail and wings. Continue working around the top now, 2dc in next st, dc2, hdc2, sl st in last & loosely sl st around the corner to round it off. Fasten off, leaving a long tail to sew down the long side to give it some stiffness. You might choose to use another yarn or embroidery thread to sew it onto amigurumi. Cute and sweet, I know 4 little girls in my family who would love one. Thanks for the pattern. Wonderful, Heather! Thank you for your kind words and thanks for stopping by our new site! 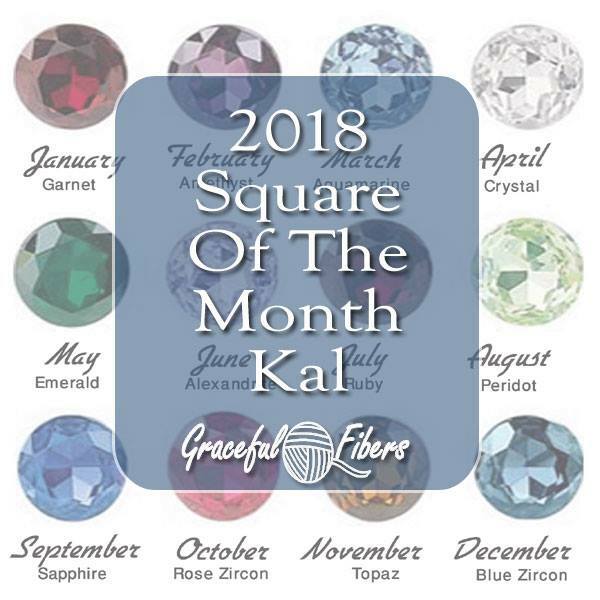 Thank you for sharing this adorable pattern. 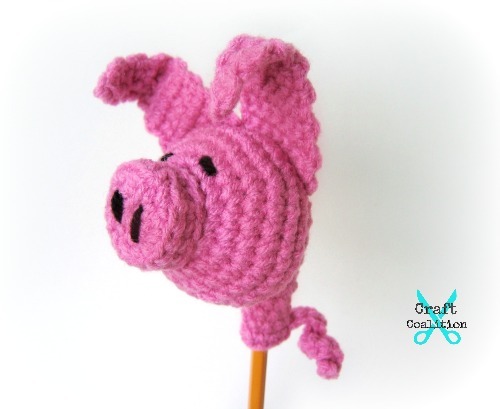 I just love piggies and this is the cutest ever, I can’t wait to make him! I love frogs too, if you ever make a frog pattern I would love to see it too! You’re welcome, Roberta! Thank you for your kind words and thanks for coming by. What a lovely little pig! Very nicely made!